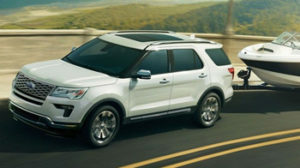 Whatever your interests, the 2019 Ford Explorer is the perfect SUV for all of your needs. The Ford Explorer is large, strong, and loaded with power (especially when you opt for the Ford Explorer Sport). 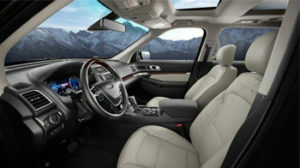 Although this SUV has lots of space for gear and passengers the EcoBoost will keep you driving past the pumps. 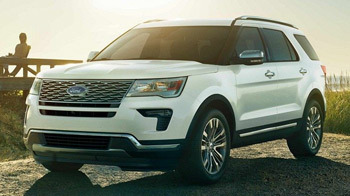 This newest edition of the long-standing Ford Explorer is a sight to behold, refined to become the perfect combination of sport utility and luxury. Check out our online showroom for more specs, trims, and pricing on the Ford Explorer and Explorer Sport, or drop by our dealership in person and talk to one of our skilled sales representatives. Magnuson Ford is just a short drive from anywhere in North Central British Columbia, including Chilliwack, Langley, Mission, and Surrey. The 2019 Ford Explorer seats up to 7 passengers with an additional third-row seating option. If cargo is your concern, it has you covered. The third-row seating can be lowered for maximum space at the touch of a button. Media in the Explorer is just a voice command away, with Microsoft’s SYNC 3 infotainment system optional on all models, and standard on some models. A Sony 10-speaker stereo system comes standard and also available are dual headrest DVD players to keep your passengers occupied in the back seat. The same Explorer drivers love is back for 2019. The Ford Explorer is a timelessly designed SUV, and is made with high-end materials that make it durable for any purpose, but also make it safer for you and your passengers. The materials we’ve constructed the 2019 Ford Explorer remain as light as ever, and just as strong as we’ve ever seen. The front fascia cuts a handsome and modern look, with subtle chrome accents around the grille and in the chin. Distinct LED fog lamps give the 2019 Explorer a more aggressive look – one that’s sure to stand out in any parking lot. The Sport model adds to this aggression with a deeper chin spoiler and larger cooling apertures that let other road-users know your Explorer has something special lurking beneath its dual-domed hood. Being built “Ford Tough” doesn’t just refer to a vehicle’s construction. It also means tough power. The Explorer’s optional 3.5 L Ti-VCT V6 engine is a beast that powers the Explorer with 290 horsepower and 255 lb-ft of torque. Fuel Economy rates in at 13.9L/100km in the city and 9.6L/100km on the highway. The standard 2.3L EcoBoost four-cylinder punches well above its weight with 280 horsepower and 310 lb-ft of torque, while still returning up to 12.6L/100km city and 8.5L/100km. The 2019 Ford Explorer also comes standard with the Terrain Management System. A system built by Ford, the TMS quickly adapts to the terrain you are driving on and optimizes driving conditions so that your Explorer won’t lose control. Handling is drastically increased with the TMS and your worries can be at ease. Also standard is the AdvanceTrac system with Stability Control—a system that provides enhanced control during high-speed and tight turns to avoid the risk of rolling. For those looking to inject some style and a lot of performance into their daily driver, look to the Ford Explorer Sport model. With upgraded exterior features that include 20-inch aluminum wheels and blacked-out grill, this smoked out SUV is sure to get a second glance. Under the hood the Explorer Sport produces an astonishing 365 horsepower and 350 Ib-ft of torque, powering through any road condition you may encounter with its advanced 4×4 system. Exhilarating to drive, the Explorer Sport features a twin turbo engine and a SelectShift transmission for maximum driver control. The 2019 Ford Explorer can’t get much more capable. Or can it? Deck it out with everything from towing kits to custom wheels and tires. Magnuson Ford’s parts department has what you need to customize your Ford Explorer with Genuine Ford Parts and Accessories.